When you want to see Congress in action, the best place to go is C-SPAN. Created by the cable television industry in 1979, C-SPAN provides the public access to the United States political process. If you have cable, you have probably stumbled across C-SPAN a few times. 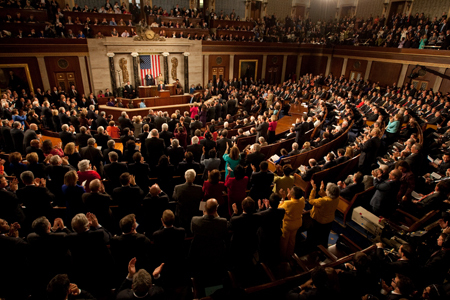 C-SPAN and C-SPAN2 offer “gavel-to-gavel” coverage of the House and Senate. Viewers can watch all the of the floor debates and votes. You can also find public committee hearings on C-SPAN as well. Additionally, the networks will provide coverage of key judicial events, and will even rebroadcast oral arguments from major Supreme Court cases. C-SPAN currently has three television channels and a radio station that provide political coverage. If you don’t have access to a television, not to worry. Viewers can watch all of the channels on the C-SPAN Website for free (links provided below). To keep up with all the programming C-SPAN has to offer, check out their schedule. If you had your heart set on seeing a particular event, but missed the live showing, you can locate an archived video in the Video Library.